And a Tazza D’Oro t-shirt made by COMMONWEALTH Press and designed by Carolyn Skye at Batdorf and Bronson and our graphics guy – Jeff Guerrero of Urban Velo. Want one? Ya you do. 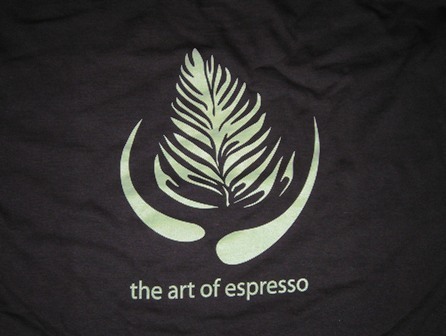 We have dark chocolate t-shirts with cream ink and khaki t-shirts with black ink. We’ve been wearing ours for a few weeks and we think there are a few folks in Atlanta (Batdorf and Bronson) walking around with them too. Olympia, I will hand deliver yours in a couple of weeks. I'm so proud, lil bro. Keep up the good work! That's one good looking shirt. can't wait for my shirt! Does it come in maternity sizes? :) Looking forward to seeing you here Amy! Hopefully this baby doesn't come before you get here. 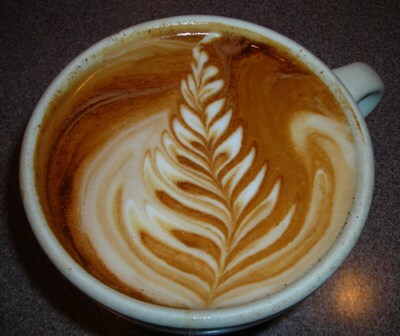 That looks so fantastic I might actually consider drinking coffee.